ANALYSIS: The role of the extreme right in the multifaceted, complex Ukrainian revolution should not be overrated. Neither should it be underestimated. Russian leaders and the Russian press have insisted that Ukrainian protesters were right-wing extremists and then that their victory was a coup. Ukraine’s president, Viktor Yanukovych, used the same clichés after a visit with the Russian president at Sochi. After his regime was overturned, he maintained he had been ousted by “right-wing thugs”, a claim echoed by the armed men who seized control of airports and government buildings in the southern Ukrainian district of Crimea on Friday. Euromaidan in Kiev, 1 December 2013. Photo: Alexandra Gnatoush, Flickr. Under Creative Commons license, BY 2.0. According to Snyder, we have rather been witnessing “a classic popular revolution”, which “began with an unmistakably reactionary regime”, “in effect an oligarchy, where much of the wealth was in the hands of people who could fit in one elevator”. Snyder makes an important point. Using social media, he called students and other young people to rally on the main square of Kiev in support of a European choice for Ukraine. That square is called the Maidan, which by the way is an Arab word. During the first few days of the protests the students called it the Euromaidan. The first Ukrainian protester to be killed was an Armenian. The second to be killed was a Belarusian. […] Dozens of people, in all about a hundred, most of them young men. Bohdan Solchanyk was a young lecturer at the Ukrainian Catholic University, a Ukrainian speaker from western Ukraine. He was shot and killed. Yevhen Kotlyov was an environmentalist from Kharkiv, a Russian speaker from eastern Ukraine. He was shot and killed. One of the people killed was a Russian citizen; a number of Russians had come to fight – most of them anarchists who had come to aid their Ukrainian anarchist comrades. At least two of those killed by the regime, and perhaps more, were Jews. One of those “Afghans,” Ukrainian veterans of the Red Army’s war in Afghanistan, was Jewish: Alexander Scherbatyuk. He was shot and killed by a sniper. Another of those killed was a Pole, a member of Ukraine’s Polish minority. Snyder’s essay, while written in solidarity with Ukraine and in opposition to Russian President Vladimir Putin’s aggressive policies towards the new government in the country, is an important contribution. It clearly shows that Russia’s policies towards Ukraine are not about confronting a “fascist coup”. Crucially, the essay also shows how the Yanukovych government used the far right for its own purposes, deliberately weakening centre-right political forces to the benefit of the extreme right. In 2012, when the extreme right-wing party Svoboda entered parliament for the first time by winning a striking 10 per cent of the votes, Ukrainian academic Anton Shektovtsov attributed the party’s success in part to Yanukovych and his Party of Regions’ “political strategy of covert promotion – and, hence, public legitimization – of Svoboda on popular TV channels”. However, Snyder only tells part of the story. As Joshua Keating wrote on Slate.com in late February, the Russian government’s portrayal “is not completely inaccurate” even if it does have a habit of tossing around labels “a bit casually”. 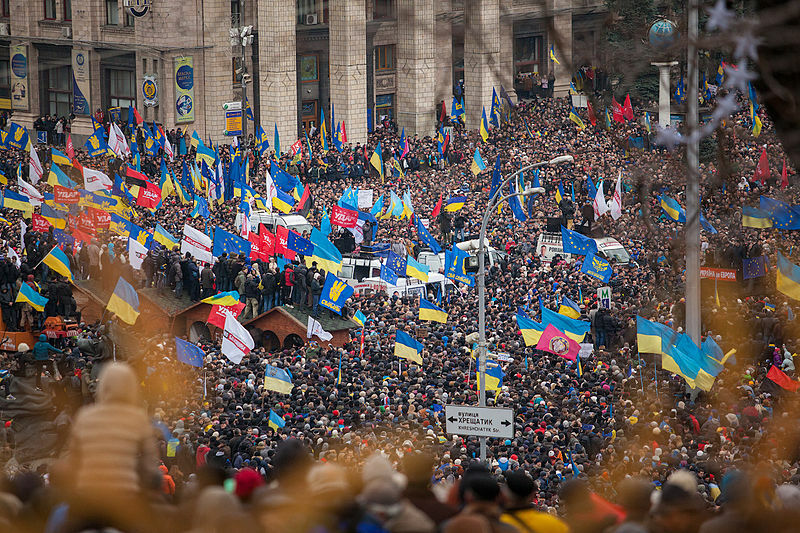 Even one of the examples used by Snyder to show the pluralist background of the Euromaidan protesters may serve as an illustration. The Belarussian protester who was one of the earliest victims of the regime’s open violence – Mikhail Zhyzneuski – reportedly left Belarus for Ukraine in 2005, citing political persecution. That is hardly an unlikely scenario in the least free of European countries. In Ukraine, Zhyzneuski became a member of the Ukrainian National Assembly-Ukrainian People’s Self-Defense, a partly paramilitary organization on the Ukrainian far right. Pictures from his funeral show the red and black flag of the organization draped around his coffin, and men in uniforms and balaclavas carrying it. The manifold nature of the Euromaidan protests becomes clear from the list of victims of the regime’s violence. One of them – the Red Army veteran Alexander Scherbatyuk, reportedly killed by a police sniper – was a Jew. 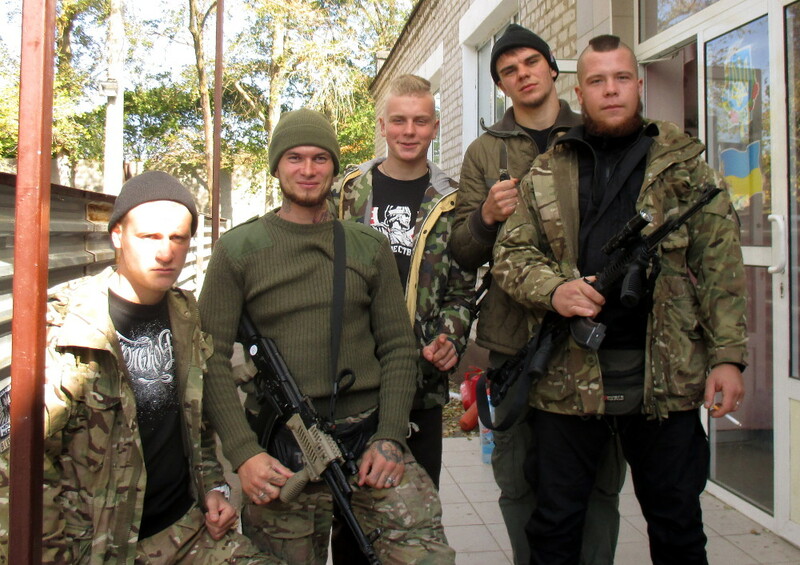 Another, as we have seen, was a Belarusian belonging to a group on the far right. The first example illustrates why it is propagandistic nonsense to describe the Ukrainian revolution as something of a fascist coup. The second underscores the point made by Cas Mudde in an analysis republished by HSI, namely that the Euromaidan “clearly included significant extremist elements”. In fact, quite a few right-wing extremists across Europe have been eager to support the revolution precisely for this reason. An example is Fredrik Hagberg, who visited Kiev as a representative for the Swedish group Nordisk Ungdom (Nordic Youth), and – as reported by Michael Moynihan in the Daily Beast – held a speech warning Ukrainians against both Russia and the West. “I stand before your forces of revolution to tell you about what your future might be if you fail your glorious endeavour. […] I stand here as a Swede. 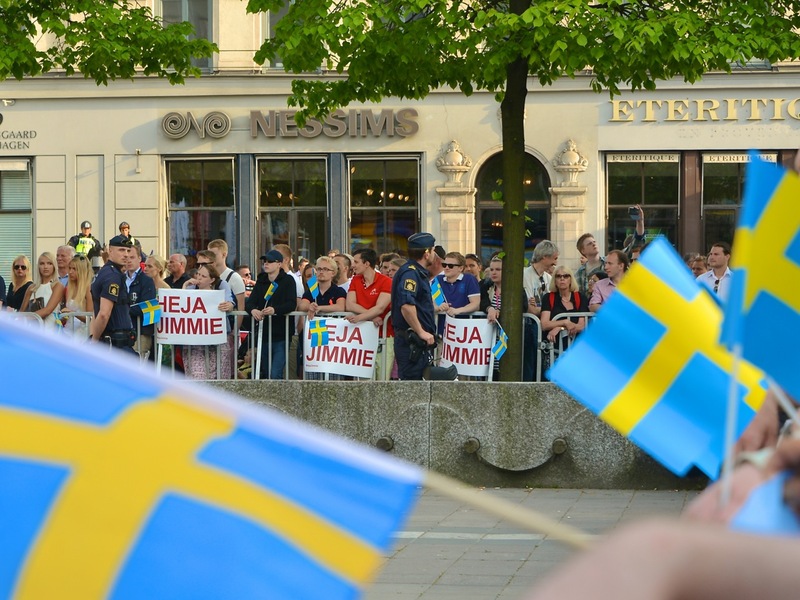 However, where I come from is no longer Sweden,” Hagberg said, stating that a successful revolution would chart a path avoiding the evils of ethnic mixing. In a response to Mudde, Anton Shektovtsov pointed out that popular support for Svoboda fell during 2013 and the party is unlikely to regain the support it enjoyed in 2012. Still, both Svoboda and other groups on the far right played a role in the revolution. 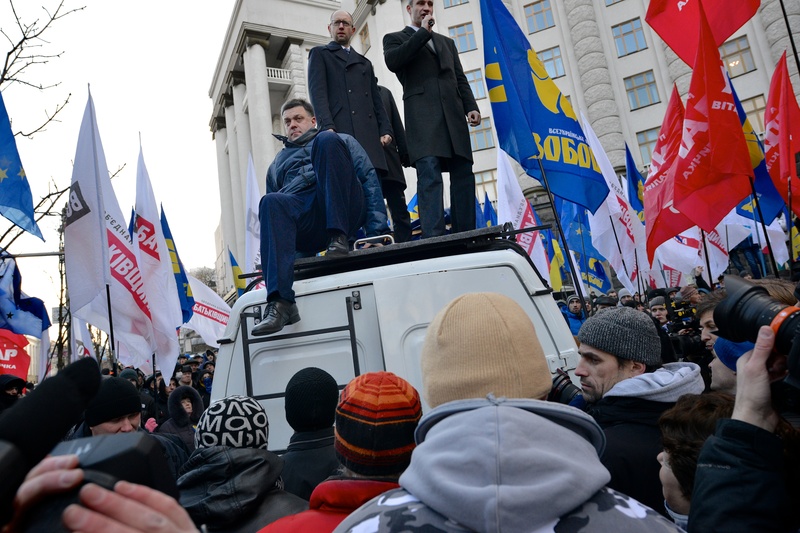 Svoboda’s leader, Oleh Tyahnobok, became one of the figureheads of the Euromaidan movement. And while Svoboda may be weaker than in 2012, it has already benefited from the revolution, gaining several key positions in the new government. Read more: A new (order) Ukraine? Tyahnobok is known for his anti-Semitic remarks, and his party was until recently part of the Alliance of European National Movements, together with such parties as Hungary’s Jobbik, the Italian neo-fascists of the miniscule Fiamma Tricolore, Nick Griffin’s British National Party and the Swedish National Democrats. Svoboda itself was founded in 1995 as the Social-National Party of Ukraine, and for a time sported the so-called Wolfsangel as its party symbol: a rune symbol that was adopted by several Waffen SS divisions during World War II, and which remains popular amongst a number of neo-fascist and neo-Nazi groups around the world. In short, Svoboda is an ominous political force, and its role in the Ukrainian revolution should be a source of worry, also for those who see Yanukovych’s downfall as good news. In light of the recent dramatic developments in Ukraine – with the Russian government effectively taking control of the Crimea peninsula, pointing to “ultra-nationalist threats” – there is also a clear risk that Ukrainian ultra-nationalism may make new gains. In short, we can conclude that the Euromaidan movement was largely a popular revolution, but, like most revolutions, multifaceted and complex. People took to the streets in protest against a reactionary government for many different reasons. Now, the situation in Ukraine has become a European crisis of enormous magnitude, largely due to the geopolitical thrust of Vladimir Putin’s Russia. We should avoid buying into the propaganda coming out of Moscow. Most of the protesters do not deserve to be tarred as right-wing extremists. At the same time we should not overlook the kernel of truth within such propaganda. The extreme right is alive and well in Ukraine, and a very radical right-wing party has gained political influence through its participation in the Euromaidan wave of unrest.